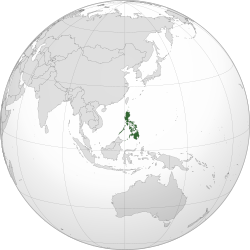 ^ While Manila proper is designated as the nation's capital, the whole of کلانشهر مانیل (NCR) is designated as seat of government, hence the name of a region. This is because it has many national government institutions aside from Malacanang Palace and some agencies/institutions that are located within the capital city. ^ In accordance with article 11 of the Revolutionary Government Decree of June 23, 1898, the Malolos Congress selected a commission to draw up a draft آنایا‌سا on September 17, 1898. The commission was composed of Hipólito Magsalin, Basilio Teodoro, José Albert, Joaquín González, Gregorio Araneta, Pablo Ocampo, Aguedo Velarde, Higinio Benitez, Tomás del Rosario, José Alejandrino, Alberto Barretto, José Ma. de la Viña, José Luna, Antonio Luna, Mariano Abella, Juan Manday, Felipe Calderón, Arsenio Cruz and Felipe Buencamino. They were all wealthy and well educated. فیلیپین یا فیلیپین‌لر آدالاری آسیا دوغوسوندا ، بؤیوک اوقیانوسون باتیسیندا ، بیر دا بیر اؤلکه آدی دیر. باشکندی ده مانیلا دیر. ↑ Republic act no. 8491. Republic of the Philippines. آرشیولنیب اصلی نۆسخه‌دن on March 8, 2014. یوْخلانیلیبMarch 8, 2014. ↑ East & Southeast Asia :: Philippines. The World Factbook. Central Intelligence Agency (October 28, 2009). آرشیولنیب اصلی نۆسخه‌دن on July 19, 2015. یوْخلانیلیبNovember 7, 2009. ↑ ۷٫۰ ۷٫۱ ۷٫۲ ۷٫۳ Philippines. World Economic Outlook. International Monetary Fund (October 2016). ↑ Gini Index. World Bank. یوْخلانیلیبMarch 2, 2011. ↑ 2016 Human Development Report. United Nations Development Programme (2016). یوْخلانیلیبMarch 21, 2017. ↑ Lucas, Brian (August 2005). Which side of the road do they drive on?. یوْخلانیلیبFebruary 22, 2009. ↑ Error on call to Şablon:cite web: Parameters archiveurl and archivedate must be both specified or both omittedPresidential Decree No. 940, s. 1976. Malacanang. آرشیولنیب اصلی نۆسخه‌دن on May 29, 1976. یوْخلانیلیبApril 4, 2015. ↑ Error on call to Şablon:cite web: Parameters archiveurl and archivedate must be both specified or both omittedRepublic of the Philippines Independence Day. United States State Department. آرشیولنیب اصلی نۆسخه‌دن on June 12, 2015. یوْخلانیلیبJuly 30, 2015. ↑ Dolan, Federal Research Division, Library of Congress (1983). Ronald E., ed. Philippines, a country study (4th ed.). Washington, D.C.: Federal Research Division, Library of Congress. ISBN 0-8444-0748-8. بۇ صفحه‌‌ سوْن دفعه ‏۲۳ نوْوامبر ۲۰۱۸، ‏۰۹:۳۶ تاریخینده دَییشدیریلمیشدیر.